Palermo is a reliably good all-day all-rounder where you can get everything from a simple coffee and a pastry, to pretty good tapas, through to a meal accompanied with a very good wine any time of the day. It is one of my favourite lunch spots. They offer a very good menú diari/menú del día for only € 10.95, which regularly features traditional dishes such as codillo al horno (knuckle), estofado de ternera (beef stew) and, of course, paella on Thursdays. The menu includes a bottle of vino tinto (red house wine) or beer. During the summer they offer excellent cold soups such as salmorejo – tomato and breadcrumb soup with crumbed boiled egg and little flecks of ham – and crema de calabacín – a cold eggplant/aubergine soup. Smart, modern and clean interior with outside seating. You’ll be rubbing shoulders with legal workers, shop and office staff, construction workers, families and elderly neighbours. 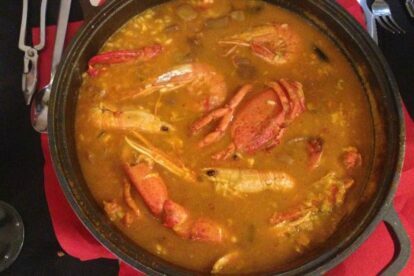 But the reason I suggest you visit is to try their excellent arroz caldoso de bogavante (lobster and rice soupy stew) – € 15.95 per person, and one of the very best in the city. Deliciously messy, very tasty, stuff. It’s an easy 10 minute stroll from La Pedrera, a five-minute walk from Casa de les Punxes, and just a few metres from Casa Thomas. So, if you’re out and about sightseeing in Eixample Dreta you may want to call in – it’s a safe bet they’ll have something you’ll like. It’s very popular at lunchtime, so, expect a five/ten-minute wait for a table.